Jul. 11, 2013 5:00 a.m.
Boating enthusiasts and their boats were decked out in red and white to celebrate Canada Day one day early, Sunday, June 30th, at Wizard Lake. About 40 boats participated in the annual boat parade, organized by residents from Curilane B subdivision. 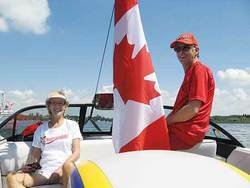 All those happy people onboard the boats were waving Canada flags and singing O’Canada as they waved to those watching from shore at the east end of the lake, including those out enjoying the hot sunny weather on the beach at Jubilee Park.